Greefs Isle of Wight, Bilton Air Cured Beef - I have to say that this really didn't appeal to me, however it does taste of beef and while it is chewy, as would be expected, it does chew farily easily. I would think it would be a talking point as a pre dinner nibble or great for hiking when you need to carry your food on your back! The Forest Kitchen Traditional Handmade Scottish Fudge 'Whisky' - This was soft and very sweet, the whisky flavour is delicate, I found the fudge rather too soft and sweet but my husband liked it. The Wee Tea Company, Rooibos & Vanilla Leaf Tea - my heart sank when I saw Redbush Tea as I've never found one that I liked...until now. As it was in the box I thought I'd better give it a go and was pleasantly surprised by how mild the flavour is. The Vanilla seems to compensate for the bitterness of the Redbush leaves. I took the tea into work to share with my colleague. She is not a fan of Redbush Tea either, but she also enjoyed this tea. 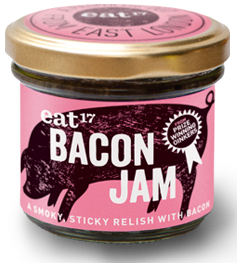 Eat 17, Bacon Jam - I was a little sceptical about Bacon Jam, but once tasted never forgotten, what a brilliant relish this is, I think I'm addicted! The highlight of the Flavour Box, for me, were the Traditional Handmade Scottish Oatcakes from The Forest Kitchen and the Northumberland Cheese Company Nettle Cheese. 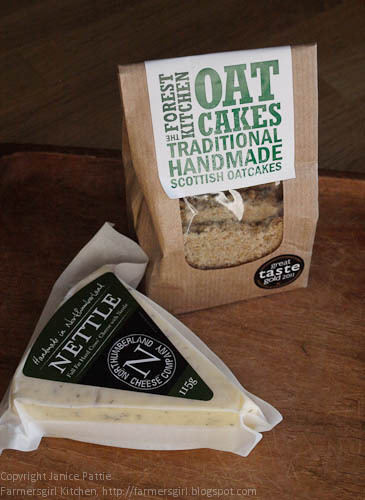 The oatcakes were crisp and crumbly with lots of oaty texture, the Nettle Cheese is a full fat cows milk cheese, it is smooth and creamy with a lovely combination of nettles and other herbs through it. They complement the cheese rather than overpowering it and the two together were a big hit with all the family. 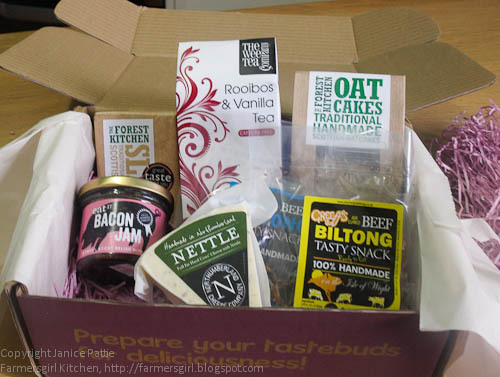 The Flavourly Flavour Box costs £22 per month and would make a lovely gift for a foodie friend or family member, or as a treat for yourself. What's more for every delicious Flavourly Tasting Box you buy, the company will donate a meal to some of the 250 food banks throughout the UK, working with the FareShare food bank charity. So you’re helping a good cause that’s close to everyone’s heart. Food banks are vital lifelines which help provide emergency food and support for people in crisis. In the last two years alone, food banks have helped to feed more than 128,000 people across the country. I received a Flavourly tasting box for review. I was not paid to give a positive review, my views are my own. I love rooibos tea and would have loved to try a new variety. My bedtime cuppa is typically a rooibos one. I have mentioned in the entry form that the most unusual food I had was probably snails. They were surprisingly tasty, but I don't think I would cook them myself from scratch, i.e. from live. Ohh I'm quite boring. The only thing I can think of was some pimms jam I had in Dorset last summer. The most unusual thing I have ever eaten is haggis. This box sounds like a nice ideas and a fun way to discover something new. I don't think I've ever eaten anything really unusual. I have eaten snails and frogs legs though. I ate ostrich when on holiday in Canada. It was quite nice really. I can't think of anything that unusual. However at an International day at university I tried some Bhutanese pastries that I was promised were mildly chillied. They were soooo hot! Earlier in the day I'd promised to try some fried caterpillars from Ghana and was very relieved to find that they'd all gone by the time I got to the stall. These comments are brilliant, I love to hear about all the different and unusual things that you have been eating. I think the oatcakes and cheese would have been my faves too, they look scrummy! Reindeer,I know that sounds awful but was so delicious! I have had hare, ostrich, bison, but not sure if these are unusual or not!! I don't have them often! I was challenged to eat cold sausage in chocolate custard when I was in junior school. I remember liking it, but that might have been bravado! I received one of these lovely boxes too, but, you are SO quick with your reviews, I have not done mine yet! 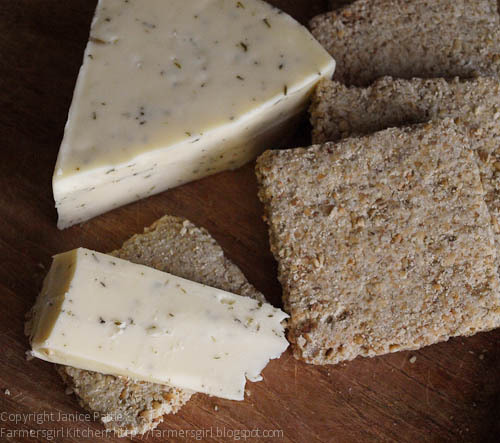 I LOVE the nettle cheese that came in the box, but then I am a cheese-aholic! I love rooibos and strangely don't find it at all bitter, whereas black tea is too bitter for me to drink. I've eaten so many unusual things in my life, but now you've asked I can't think of a single one. So I'll go with what we had for lunch today, which were some Tigridia bulbs - the first time I've eaten them. Delicious they were too. Bear - unusual for here, not so much for where I was at the time. The FLAVOURLY10 code doesn't work, sad! I ate Kangaroo steak .... it was really nice ... more like Game than normal red meat. i've had squid, springbok, boar, kangaroo...are these odd?